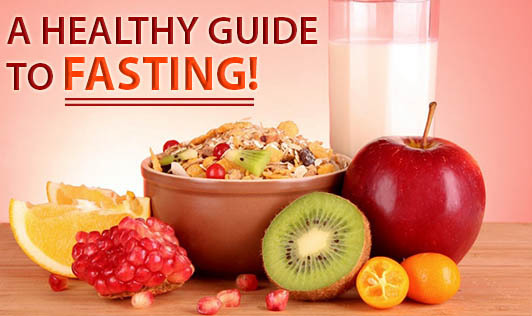 A Healthy Guide To Fasting! 1. Be productive during the fast. Move around and keep yourself engaged in any activity you like. 2. Drink a lot of fluids like water, milkshakes, fruit juices, tender coconut water and buttermilk. These can keep you hydrated without compromising on your fast. 3. Stick to fruits of your choice to keep you energized. 4. Vegetable salads and sprouts are other options to fruits. 5. If you can eat curd, do so at least 2-3 times a day. It will meet your protein and calcium requirements. You can also have lassi for a change. 6. Try and avoid strenuous physical activities. This way you will be able to retain your energy the entire day. 7. Dry fruits like almonds, cashews, walnuts, figs, and dates can up your energy level. 8. If the fasting ritual permits, you can have small snacks (corn, puffed rice, rice flakes etc) with regular fruits and vegetables. 9. Limit your caffeine, sugar and salty food intake. 10. To restore vitality of your body, make sure you get quality sleep of 8 hours a day.